As a young girl, my favorite vacation game involved a swimming pool. 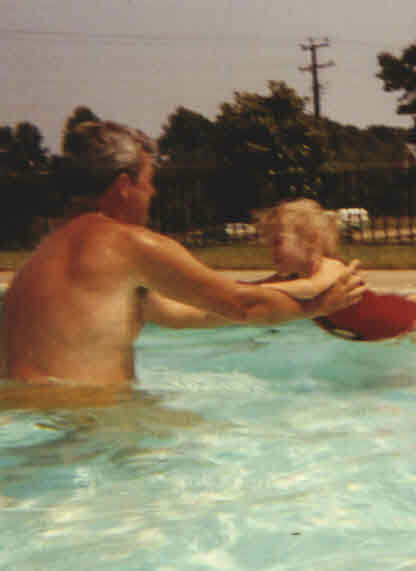 My father would stand in the pool; I would crouch on the side. “Catch me!” I’d shout as I jumped into his waiting arms. He never missed. And I knew that. I jumped with the surety of someone who knows she is totally protected. Completely safe. I was scared of the water. Fearful of going under. But I knew Dad’s promise was solid. As I look around me, in my middle age, I am surrounded by people who still just want to be caught. Plenty of marriages implode in one’s mid-forties. Friends, coworkers, neighbors. Plenty still plugging away, too, toward that silver anniversary. Or should I say, knowing you will be caught. When you get that big promotion and the sharks are circling as you try to prove yourself for the first six months. Only the sharks get the better of you. When your routine trip to the doctor turns into a 12-month cancer ordeal in which you wretch, go bald and cry. When your child turns to cutting, drugs or suicidal thoughts. And sometimes, it’s not so dramatic. You want to be caught on your fat days and loved anyway. 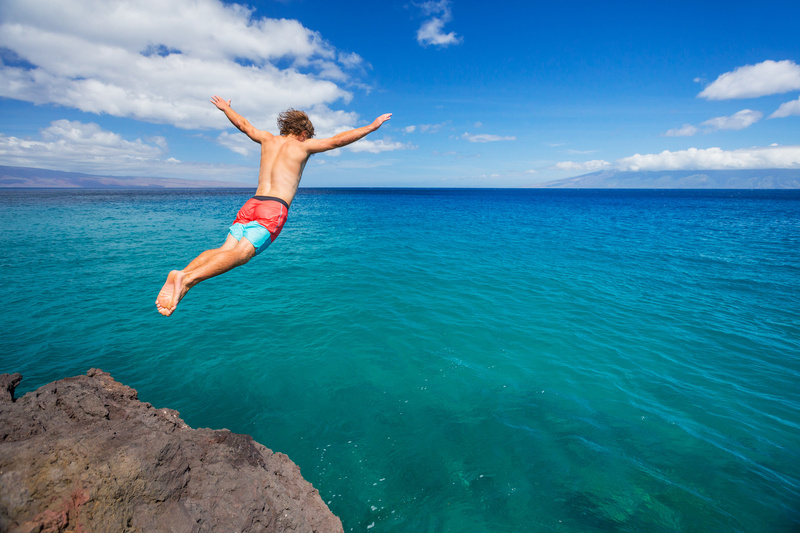 Man jumping off cliff into the ocean. Summer fun lifestyle. On the days you have nothing new to say, no witty banter to offer, no stunning repartee. Most of us never outgrow the desire for surety. Knowing that our partner is solid in the face of unemployment, tough kids, a boring Wednesday night, the cute blonde at work. Those of us for whom the fairy tale did not work out recognize that surety can seem an elusive desire. I see it in couples around me. It is not always pretty. Sometimes it is testy. Or demanding. Or blind to its own faults. But it stays. Holds our hand. Catches us as we jump in joy, fall in failure, leap in loving awareness that there is a net. Arms will encircle us. And we will not go under. To say “catch me” and know we will be caught? Why, some call that Heaven. And others just call it love. “To say “catch me” and know we will be caught? I love this analogy! In fact, I wrote on a very similar one about my own father. I like how you have connected it to our relationships in general. It is so right on. (If you are interested in my kindred post, check out http://thejugglestruggle.net/2013/09/09/always-at-the-bottom-of-the-slide/. I hope that’s not too presumptious! Thanks, Lisa:). I will definitely check out your post also. Thank you for stopping by and for the kind words! Will have to check out your blog. A great description of long term love. Thanks for reminding all of us not to take it for granted! It is such a beautiful thing and such a reassurance when life gets hard. One of the nicest compliments you could have given me. Thank you! Wow! Very beautifully written Kay. I feel a heart beginning to see…an opening in a dark world…a breath of fresh air. May it also be the beginning of your truth Kay, an acceptance of who you truly are within. You describe this feeling of security and faith in someone else so remarkably well. Oh so true, Kristine! I think that in losing Mick, this was what scared me the most. No one to catch me… So well said. I know my loss was divorce, Dale, and yours was done but you are right. Regardless, everyone wants to be caught. Here’s to a fantastic freefall and a soft landing in loving arms for both of us. I can’t presume to understand how difficult it would be to lose a spouse to death. I can say, the divorce is quite hard because while it feels as if there’s been a death-the death of a marriage-The person still lives and breathes as they did when you married them. Even though the person you married no longer seems to exist as they did when you marry them. It’s a painful, constant reminder. That’s what my friend was referring to…a divorce is the death of a marriage but a constant “in your face” reminder. Death is final. Brings its own baggage but, if one is to find something positive out o a seemingly negative-only thing, it is that you have no outward reminders of your loss. Weird though that may sound. Most of our fights were about the kids…. Damn, I miss him!